The Easy Tables plugin is a quick and easy tool designed to help you add tables to your posts and pages. 3. Place your mouse where you want to insert the table then click on the Insert a new Table icon. 4. 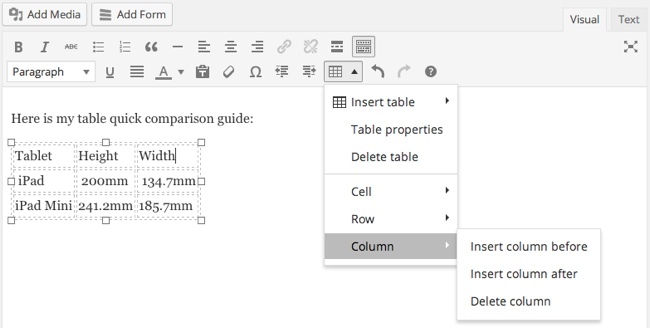 Hover over the “Insert table” link to specify the number of columns and rows you want to use. You’ll choose the number of rows and columns by dragging your mouse so that the correct number are highlighted blue. When you have selected the correct number of columns and rows, click on the squares and your table will be inserted into your post. In this example, we are creating a table with five columns and five rows. Your table will look like the following when inserted. The cells will expand as you add your content. 5. Place your mouse in the first cell and type the contents you want to add to the cell. 6. Repeat the process to add the content to all cells. Use the left and right arrows to move between the cells. 7. You can insert, delete, cut, copy or paste rows by clicking into any row on the table and then choosing an option from the Row menu. Similarly, you can add or delete columns by clicking any column in the table and then choosing an option from the Column menu. 8. The Table Cell properties can be edited by clicking on any cell and then choosing Cell > Table cell properties from the menu. The Cell options also allow you to merge and split table cells. Here is what the Table cell properties menu looks like. 9. Click anywhere in the top row and then click on the Row > Table row properties option. 10. Select Header for Row Type and click OK.
11. Highlight the top row and then click on Cell > Table cell properties icon. 12. Select Header for Cell Type and click OK. Here is what our table looks like in a post. The appearance of the table is controlled by the theme you are using. You can add style code, change the border color or change the background color for the entire table by opening the Table Properties and using the options in the Advanced tab.